We all have painful memories. Some memories would have been so painful when we encountered it. But when we turn back and look back at those painful moments, we might end up having a smile in our faces. Everyone would have painful memories - be it emotional or physical. But do we cling on to the painful memories? Note: Painful memories that you have come across,can be shared in the comment section. Please note that the aim is not to vent or crib in the comment box, but to convey your positive take on painful memories. It might be soothening for many pained souls. well :P lol @ the poem....i hope u were the only one to return from bermuda triangle then :P..
Well painful memories.. hmm.. saying good bye to people I loved.. but i grew from it.. well I think.. i was growing up anyways..
o well, I take all the 'kicks' I've received and turn em into 'punches' going out to the other side. LOL! And hey when did u get all senti? :) Very nice post from ya Chriz the nut! ahem! what a poetry talent! what a talent! hit the wrong ball, lol! For me, I fell down numerous times while practicing this move with my partner in group dance competition during school days. He had to pick me up and put me down, but he picked me up and threw me down! It was so painful back then, but now all I can do is smile, looking back at those days. 4th April... 0800 hrs.. I was going for a flight, and before the flight we students have to go for a walk around the airplane to make sure everything is in place and the plane is good for flying... so i grabbed my headset and keys for the aircraft and started walking towards it..
Ah! oh-my-god! when I look back, I see that I dont have such bizarre incidents in my life! Reminds me of the times.. I tried to learn how to ride bicycle.. the first time I landed up in the 'saakade' and second time hit the truck.. the truck was not in the motion .. lucky for me..
OO...painful memory when i got fracture..in my leg...while playing volley ball..and more painful was when ppl commented....."what is relationship of leg with volley ball :P"
hi, i would need thousands of comment boxes, to fully write, but thanks for reading my story. i have posted again, did like the font in my early attempt to publish the story. looked funny with muddles fonts in between, so had to publish again. you can read it now. Regards. aweeeeeeeeeee....so sweet...was that you who was described in there? hahahahaha!!! you bet he got the wrong ball!! he wanted a new toy. and went and he told his mommy so. or a cop car that goes round and round. so get me something to play & push around." and they called it a kid! 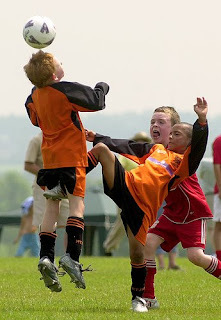 that's how the boy got kicked!!. cause she bites and spits. for me my most painful memory is departing from my parents....its been 2 yrs since i saw my mom-dad but only after being so distant from them i realised what they really mean to me!!! My love for them has grown strong over the yrs....i loved them b4 also, but now its a diff feeling! Now this is smth I cant do ever. And you wanted me to write one for you !!!! My most painful memoir would be the walkin away of my best friends.We'd shared a frenship of about 15 yrs. But now in retrospect, I feel its all good. Things happen. All we gotta do is take a pill n move on. "got the wrong ball" Lol...!! when I was in dance class my partner dropped me real hard on the ground. I had a sore leg for two days. The truth is that I had actually let go of him coz he was losing his balance. If i had not, he would have fallen over me and that wouldn't have left me only with a sore leg...Lol..! oh so even chriz gets senti shenti haan? i have had a similar incident while playing cricket.. n that was when i learned you have to pay attention to the bowler while keeping wickets. great post..lovely poetry..ouch!! there are quite a few painful memories..but I have realised that what gave me joy once only had the power to give me pain later..so wudnt want to delete any of them coz if i erased the pain the pleasure associated wud go too right? And exactly how did the Bermuda Triangle look in your thoughts? I'm mighty curious. "And kicked the wrong Ball" sorry I know its rude to laugh, but not able to stop..
Hey Chriz...fot funny and the rest senti ah? enanga achi ungalaku? ok ok ....chweet memoirs ya! Well painnful memories for me..hmm ya most of the times when i was/had forced to say a NO where it shud hav been a YES, which indeed changed my life 4vr! hey that pic is painful! n what happened to u?? poem n all! You can write a poem too?? ouch that hurts my ego. Hmm..Painful at first and laughable later! Maybe the sweet 16 memories! Heyy you emo? Whassup? :O Everything allright? I remember when we had gone to Poconos for snow tubing - the ice was so slippery and my boots weren't right I kept slipping and sliding and finally just fell down sliding a long way down , taking the next two three people with me ... lolzzz... Everyone in line was laughing at and with me and it was only later I saw that I was black and blue :)) Good fun !! Yeah what do you expect! You give the person three choices, and only one of them is right. Then there is more than 66% chance of kicking the wrong one! Anyways, I played football only twice in my life. So no such painful memories to share! wow !! if only people saw thier pain like this... as something to be laughed upon. dunno abt the making me smile part of it but I definitely know abt the making me strong part of it!!! But My l-rd You are so accident Prone Mr. lol! Why did you hit the right ball ?? Yes, I have painful memories when I met with a car accident in NYC but through all the tears & pain, my family bonded together and we can smile at this incident every now and then. Wow.. very well written dude.. I guess recollecting these moments will always bring up a smile..
ha ha!! i enjoyed this one .. its a good thing to know how to laugh on ur painful memories !! Aahaha. Very, very nice piece of poetry. And.. painful memories? Yeah. They were painful when they happend. But as time passes by, i feel it all fades away. So yah. Everything is superb in the end. This was too good man!! Painfull memories ahhh... Apdiyellam yaarum illa ba..